You're back for more? I'm so glad you decided to check out the awesome work my students did! Here we go! The text scrolls were ready. I paired students heterogeneously and assigned each group a text scroll based on their academic abilities: can you differentiation? Some of these were definitely harder than others! Once each pair had their text scroll, a colored pen, and a highlighter (for each person), I walked them through some steps. For each step, I stopped them where they were at in the task, got everyone's attention, and gave them the next task. For each task, they wrote the next number and made a note if I asked them to, or they answered a question that I provided. Task 1. Create a key with your highlighter and pen. Make a mark with each and write your name beside it. Task 2. Take a moment to skim through the text. Then, write the number two and write what you think the text structure is beside it. At this point, I circulated the room and approved text structures. If they were right the first time, we celebrated. If they weren't right, I asked them some questions and gave them some comments to help guide them toward the best answer. Things like, "what evidence makes you think that this text is compare and contrast?" and "think about the main purpose of the text, although it may compare things, what is its main purpose?" This is the point where we talk about the right answer versus the best answer. Although it CAN have more than one text structure, there is usually one that fits better than the others. Once I'd approved all of the text structures, we moved on. I asked them to read through their scroll and annotate. They used their colored pen to underline evidence that supported the fact that it was "x" text structure. 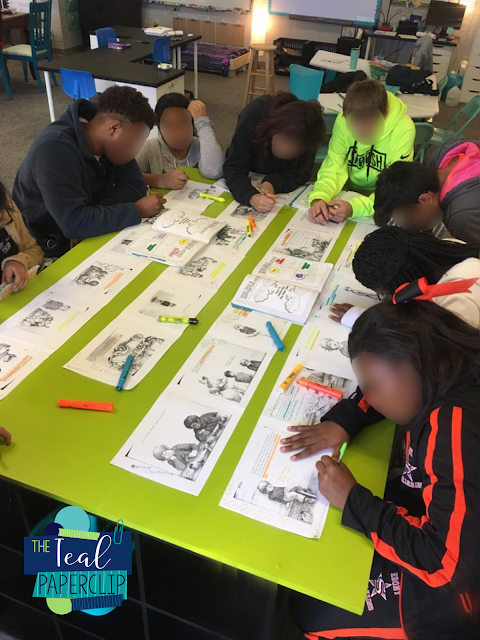 For every piece of textual evidence that they underlined, they had to provide an annotation in the margin that provided their reasoning. Their "BECAUSE". You can see them making annotations here. Once they were done with their evidence, I asked them a few more questions. Task 4. What other text structure would have worked and why? They looked through their notes on text structure and discussed with their partner about alternate text structures. Then we switched gears. This assignment was the culminating task for a couple of different lessons: main idea, author's purpose, and text structure. So at this point, we started looking at author's purpose and main idea. Task 5: What is the main idea for this particular text? Task 6: What is the author’s purpose for this text? Why? Highlight at least two pieces of evidence that meet the requirements for that purpose. This step is where the highlighters came in. 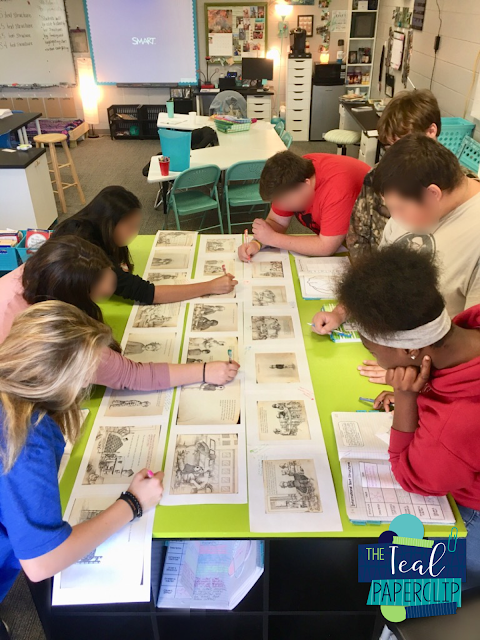 I wanted their text structure annotations and their author's purpose annotations to be separate so that they could easily differentiate between the two types of annotations. Once students had completed all of the steps, I had them roll their text scrolls up and turn them in. 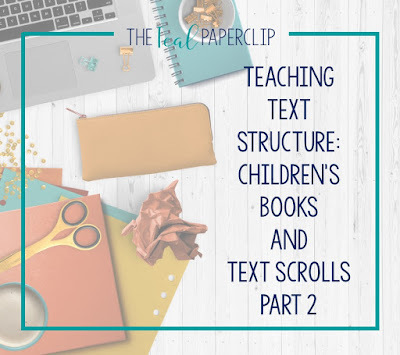 We had a short wrap up discussion about the purpose of text structure, how we can use this skill in the real world, and why texts are structured certain ways. We also touched on author's purpose and revisited the question about how author's purpose and text structure are related. Let me just say this: it was awesome. All of my students were engaged, and they really seemed to have a better grasp of text structure after this. Seriously! It was wonderful. Plus, it was an observation lesson, and my admin loved it which was just an added perk. To be fair, we had practiced the day before as a whole class. I don't like to use direct instruction during my observation lesson because I feel like it makes me the focus of the lesson. I want my admin to see my students working and applying their knowledge. However, it's always a good idea to teach your students a procedure for doing something before you let them loose. Therefore, we modeled it and worked through it as a class the day before. 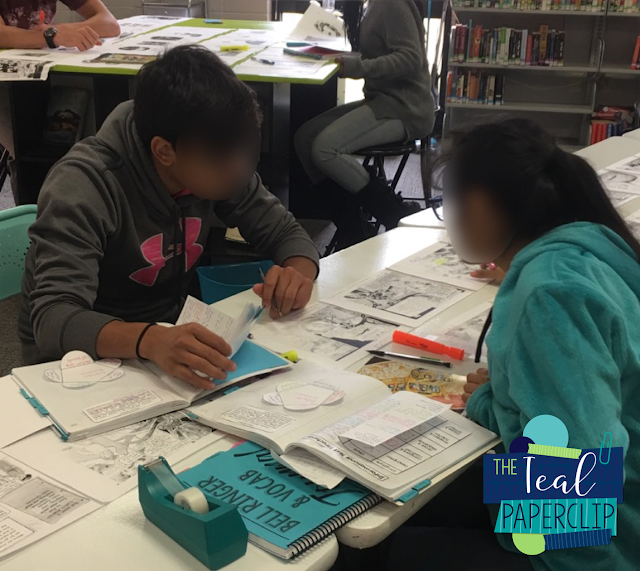 Then when it was there time to apply their knowledge of the content and process to a new book, they were ready! What do you think? Do you think your students would be engaged? Do you have a great idea for using children's books or text scrolls? Please share it in the comments below!